It’s an exciting time for the West Midlands based club; when the new owners took control last year part of their strategy was to place a big emphasis on the style of football they wanted Wolves to play. 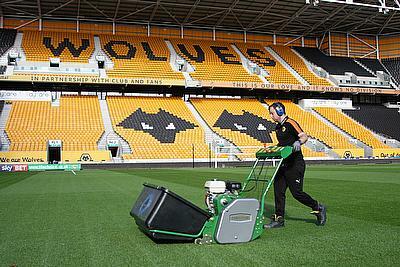 As a result they were committed to investing in the surface at Molineux Stadium. A state-of-the-art Desso Grassmaster hybrid pitch, which is used by top clubs across Europe, was installed shortly after the new owners’ arrival. Secondly, it was time to look at upgrading the turf maintenance machinery. Lightweight at just 166kg; it is easy to manoeuvre and comfortable to operate. The handlebar console houses the controls for - throttle, parking brake, roller drive and cutting cylinder drive. The mower also features a large diameter front roller with an adjustable scraper which has been designed for a precise height of cut control, giving an excellent finish on every occasion. The Dennis G860 also features an interchangeable cassette system to assist with a wide range of tasks. With a simple one-minute changeover, users have the option of fitting thirteen different types of cassettes including scarifiers, verticutters, brushes, spikers, and slitters as well as six, eight or eleven bladed cutting cylinders. “We purchased three G860’s with the full range of cassettes which gives us so much versatility,” says Anthony. “We use them on a daily basis. The verticutting unit is used quite regularly to clean out the surface and we really see the benefits from this. The brushes are a great option too and we use the machines at both the stadium and the training ground. 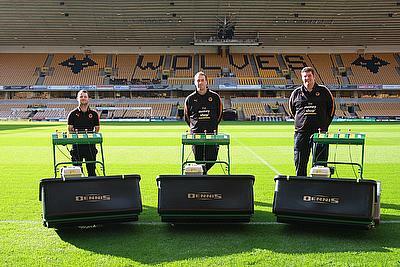 “With three mowers we now double cut on match days and the G860’s are perfect for presentation and getting a quality finish every time. They create the ideal pitch suitable for how the owners want the team to play.